Welcome to another Good e-Reader Comparison! 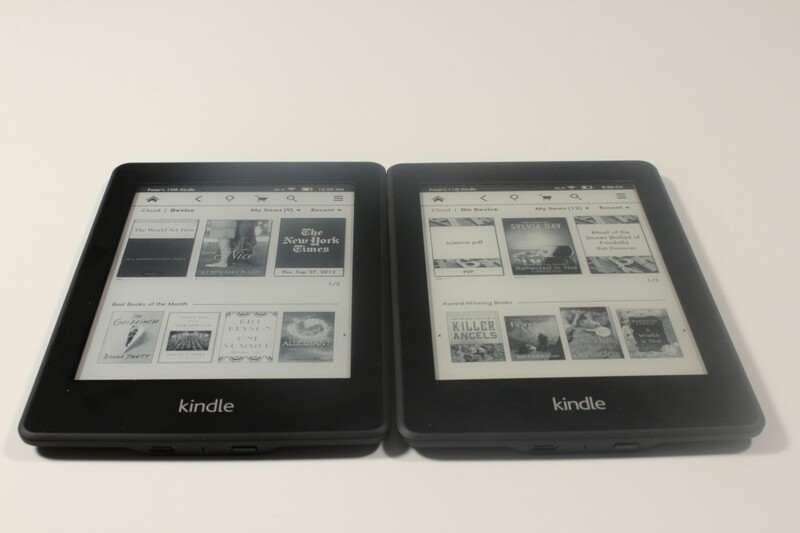 Today we check out the previous generation Amazon Kindle Paperwhite and one that just came out this week. We evaluate the hardware, software and glowlight. The hardware for both models is relatively the same with the second generation having a bit faster of a processor. Underneath the hood is a 1 GHZ vs the 800 MHZ on the Paperwhite 1. Both models have 256 MB of RAM and 2 GB of internal storage. The majority of your content will be held in the cloud that you purchased from Amazon. The Glowlight seems more refined in the second generation model with the overall display being a tremendous upgrade. The original Kindle Paperwhite for its time blew away the Kobo Glo and Nook Simple Touch with its front-lit display. The second generation evenly distributes the light more evenly and its less blue then before on higher settings. One of the new software enhancements on the Paperwhite 2 is the ability to maximize the brightness with the click of a button. You also have the ability to completely shut off the light, which was lacking in the first iteration. One of the big new features on the Paperwhite 2 is called Vocabulary builder. Any singular word you highlight will be placed in this folder accessed from the settings menu. Each word when you click on it will give you the dictionary definition and usage. The usage aspect is very interesting because instead of using the standard thesaurus, it will use the usage from the book you are reading. If you have a bunch of Vocabulary words, you can make Flashcards out of them, and have a virtual slideshow of all your words. This is useful for academic textbooks, bookclubs and a myriad of other practical uses. The Paperwhite 2 will see a number of software upgrades over the course of the next month. Kindle Freetime will allow parents to setup accounts for their kids and manage permissions. Goodreads will also be available for a social book network, to talk and rate books. the paperwhite was better then the glo, kobo did not get their act together until the Aura. I’ll just presume your Paperwhite didn’t have any uneven lighting or blotchiness that has been widely reported by others. I had trouble reading this article. No it doesn’t. And don’t even think about it if you’re into reading pdfs. this may seem like a dumb question. I was looking on amazon for the kindle paperwhite 2, but nothing really showed up. So I assume its still just called the kindle paperwhite, but its been updated. If so, how do I know if I am ordering the first generation or the second generation? Ridiculous this hasn’t been corrected since 5 month ago. I agree re: the grammar. Come on, it’s not rocket surgery.